Our traveling smith had heard enough. This was a temperance and tool lecture to him, he began to think of all the trips he had made to this town. Twelve trips a year, three dollars a trip for liquor and the time lost must be worth two dollars per day. He figured it out and would have turned back if he had not been so close to the place. He took a glass of beer but it didn't taste as usual and he asked for a cigar. With this he returned,and on the road home swore off for good. He bought a tire holder at once to start in with, and by this time he is one of the best smiths in the country, always at his stand ready to do the work brought to him, and his customers now know that he is to be found in his place, with tools of all kinds and a sober hand to use them with. Do thou likewise. 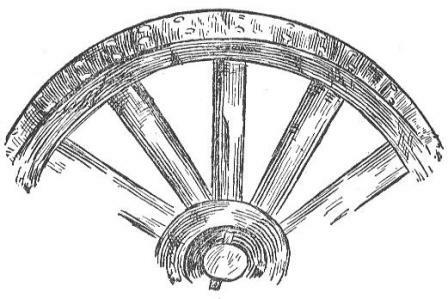 Many of us remember the time when tires were made in sections and nailed on, at this time the wheels were more substantially made, because the tire could not be set as tight as it is now, and the wheel had to be made so that it would- stand the usage almost independent of the tire. Our endless tire is a great improvement over the tires made in sections. The wagon tires as they are made now are, I think, as near right as they can be, in regard to size of iron, in proportion to the wheel. But it is different with buggy tires. I hold that they are all made too light to be of any protection to the fellows. I understand the reason why they are made this way, but if a man wants a light rig, let that be the exception and not the rule. Tire should not be less than one-fourth of an inch thick for seven-eighths wide, and five-sixteenths for an inch wide and over. A tire four feet in diameter will expand two inches and a quarter, or three-sixteenths of an inch to the foot. Steel tire expands less. This is the expansion of red heat. If heated less it expands less, but it is no trouble to make the tire expand for all the draw it needs. A furnace for tire heating 'comes handy in cities where there is no chance for making a fire outside, but every smith that has room for a fire outside will do better to heat the tire that way. Don't build a tire heating furnace in the shop if wood is to be used for fuel, because the heat and smoke will turn in your face as soon as the doors of the furnace are opened.